In a column about the California adventure (and there are more columns to come, as I now have time to blog about all the photos I took), I posted a photo of the words of the day for each vacation day. I couldn't, at that time, find the photo of the word for Wednesday's travel day. It was in a different file. This could be apropos. 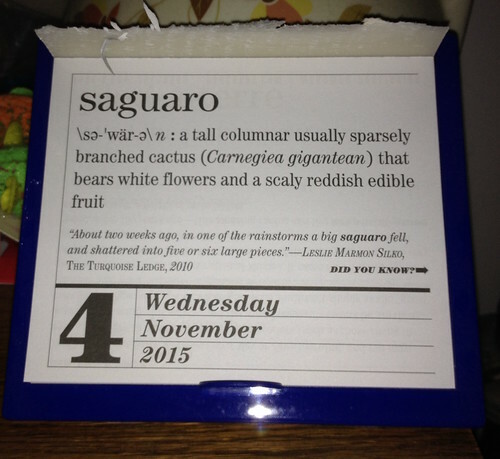 I'm not sure that saguaros are native to Southern California but who knows. I didn't see a live one. There were fabricated ones in Cars Land in the California Adventure, but I don't remember a live one. Still, I was headed in that general direction. I remember thinking, when I ripped the day previous off and saw this that I felt it would be a harbinger for a great vacation. I was right.